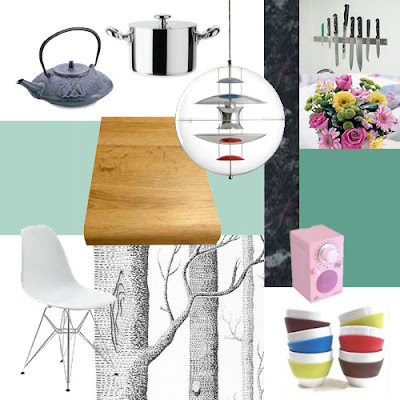 This is a little mood board I made, trying to bring together some of the inspiration I've found for my kitchen. It's a scandinavian country style with an urban touch, I guess. Or maybe the other way round. A couple of designer classics, like the Verner Panton lamp and Eames chair. Pink radio from Tivoli Audio, wall paper from Cole & Son and Koziol drinking bowls.